Sunroof, Navigation, Heated Leather Seats, 3rd Row Seat, All Wheel Drive, Panoramic Roof, Captains Chairs, Trailer Hitch SEE MORE!KEY FEATURES INCLUDELeather Seats, Third Row Seat, Navigation, Sunroof, Panoramic Roof, All Wheel Drive, Power Liftgate, Rear Air, Heated Driver Seat, Heated Rear Seat, Cooled Driver Seat, Back-Up Camera, Premium Sound System, Satellite Radio, iPod/MP3 Input. Rear Spoiler, MP3 Player, Rear Seat Audio Controls, Privacy Glass, Remote Trunk Release. OPTION PACKAGES2ND-ROW DUAL CAPTAIN CHAIRS PACKAGE Two bucket seats w/fold-down armrests in place of standard 2nd row 3-passenger bench seat, 2nd Row Captain's Chairs. Volkswagen 3.6L V6 SEL Premium with PURE WHITE exterior and BLACK LEATHER interior features a V6 Cylinder Engine with 276 HP at 6200 RPM*. EXPERTS RAVE"With ample cargo space in back, numerous storage bins throughout the cabin and second-row seats that can slide forward with child seats installed, the Atlas delivers above-average utility in this class." -Edmunds.com. WHO WE ARENorth Park Volkswagen of Dominion is located at 21315 West Interstate 10, just east of Friedrich Park. Volkswagen is widely recognized for quality, reliability, value, and an award-winning commitment to customer satisfaction. Our state of the art dealership has the largest VW inventory in Central Texas. Visit us at www.northparkvw.com to schedule an appointment with one of our VW Experts. Please confirm the accuracy of the included equipment by calling us prior to purchase. CARFAX 1-Owner. Heated Seats, 3rd Row Seat, Keyless Start, Onboard Communications System, Smart Device Integration, CD Player CLICK ME!KEY FEATURES INCLUDEThird Row Seat, Rear Air, Heated Driver Seat, Back-Up Camera, Satellite Radio, iPod/MP3 Input, CD Player, Onboard Communications System, Aluminum Wheels, Keyless Start, Blind Spot Monitor, Smart Device Integration, Cross-Traffic Alert, Heated Seats. Rear Spoiler, MP3 Player, Keyless Entry, Privacy Glass, Steering Wheel Controls. Volkswagen 3.6L V6 SE with PURE WHITE exterior and TITAN BLACK V-TEX interior features a V6 Cylinder Engine with 276 HP at 6200 RPM*. VEHICLE REVIEWSEdmunds.com explains "With ample cargo space in back, numerous storage bins throughout the cabin and second-row seats that can slide forward with child seats installed, the Atlas delivers above-average utility in this class.". Great Gas Mileage: 25 MPG Hwy. SHOP WITH CONFIDENCECARFAX 1-Owner WHO WE ARENorth Park Volkswagen of Dominion is located at 21315 West Interstate 10, just east of Friedrich Park. Volkswagen is widely recognized for quality, reliability, value, and an award-winning commitment to customer satisfaction. 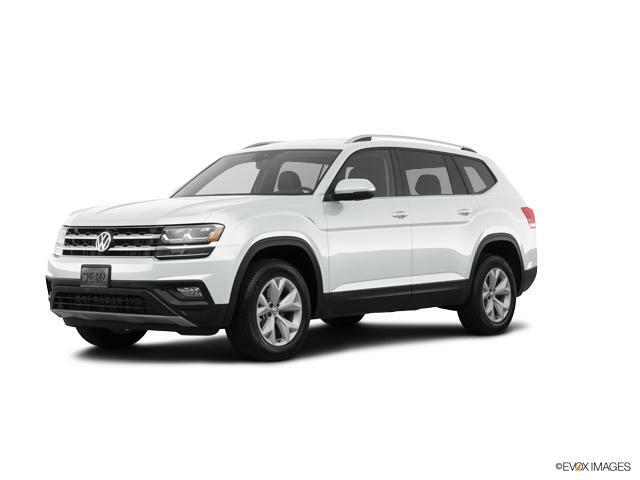 Our state of the art dealership has the largest VW inventory in Central Texas. Visit us at www.northparkvw.com to schedule an appointment with one of our VW Experts. Please confirm the accuracy of the included equipment by calling us prior to purchase. CARFAX 1-Owner, ONLY 14,835 Miles! Sunroof, NAV, Heated Leather Seats, 3rd Row Seat, All Wheel Drive, Quad Seats, Panoramic Roof AND MORE!KEY FEATURES INCLUDELeather Seats, Third Row Seat, Navigation, Sunroof, Panoramic Roof, All Wheel Drive, Power Liftgate, Rear Air, Heated Driver Seat, Heated Rear Seat, Cooled Driver Seat, Back-Up Camera, Premium Sound System, Satellite Radio, iPod/MP3 Input. Rear Spoiler, MP3 Player, Rear Seat Audio Controls, Remote Trunk Release, Keyless Entry. OPTION PACKAGESSIDE STEPS (SET OF 2), 2ND-ROW DUAL CAPTAIN CHAIRS PACKAGE Two bucket seats w/fold-down armrests in place of standard 2nd row 3-passenger bench seat, 2nd Row Captain's Chairs, ROOF RACK BASE CARRIER BARS Set of 2, 20" BLACK WHEELS Wheels: 20" Mejorada Black Alloy. Volkswagen 3.6L V6 SEL Premium with DEEP BLACK PEARL EFFECT exterior and GOLDEN OAK VIENNA LEATHER interior features a V6 Cylinder Engine with 276 HP at 6200 RPM*. EXPERTS ARE SAYING"With ample cargo space in back, numerous storage bins throughout the cabin and second-row seats that can slide forward with child seats installed, the Atlas delivers above-average utility in this class." -Edmunds.com. SHOP WITH CONFIDENCECARFAX 1-Owner MORE ABOUT USNorth Park Volkswagen of Dominion is located at 21315 West Interstate 10, just east of Friedrich Park. Volkswagen is widely recognized for quality, reliability, value, and an award-winning commitment to customer satisfaction. Our state of the art dealership has the largest VW inventory in Central Texas. Visit us at www.northparkvw.com to schedule an appointment with one of our VW Experts. Please confirm the accuracy of the included equipment by calling us prior to purchase. Heated Seats, Onboard Communications System, CD Player, Dual Zone A/C, Keyless Start, iPod/MP3 Input, Turbo, Alloy Wheels CLICK ME!KEY FEATURES INCLUDEAll Wheel Drive, Heated Driver Seat, Back-Up Camera, Turbocharged, Satellite Radio, iPod/MP3 Input, CD Player, Onboard Communications System, Aluminum Wheels, Keyless Start, Dual Zone A/C, Smart Device Integration, Blind Spot Monitor, Heated Seats. Rear Spoiler, MP3 Player, Keyless Entry, Privacy Glass, Child Safety Locks. Volkswagen SE with PLATINUM GRAY METALLIC exterior and GRAY LEATHERETTE interior features a 4 Cylinder Engine with 184 HP at 4400 RPM*. EXPERTS CONCLUDEEdmunds.com's review says "Top-notch material quality is evident throughout. The Tiguan feels more upscale than most in the segment.". Great Gas Mileage: 27 MPG Hwy. WHO WE ARENorth Park Volkswagen of Dominion is located at 21315 West Interstate 10, just east of Friedrich Park. Volkswagen is widely recognized for quality, reliability, value, and an award-winning commitment to customer satisfaction. Our state of the art dealership has the largest VW inventory in Central Texas. Visit us at www.northparkvw.com to schedule an appointment with one of our VW Experts. Please confirm the accuracy of the included equipment by calling us prior to purchase.